October: Please note Sevenoaks BC matches now start at 8.15 pm and not 8.00 pm. We're used to reporting here that our Juniors have won this tournament on a regular basis (see further below) but it's a rare event to see our senior team come up trumps. Albeit a couple of the players were under 18 but a win is a win and for the first time in a number of years TWBL can stand proud in this event. To complement this win, our U19 Juniors walked away with the Kent Inter-Regional title the day after. Both events are staged annuallly at the University of Kent in Canterbury. 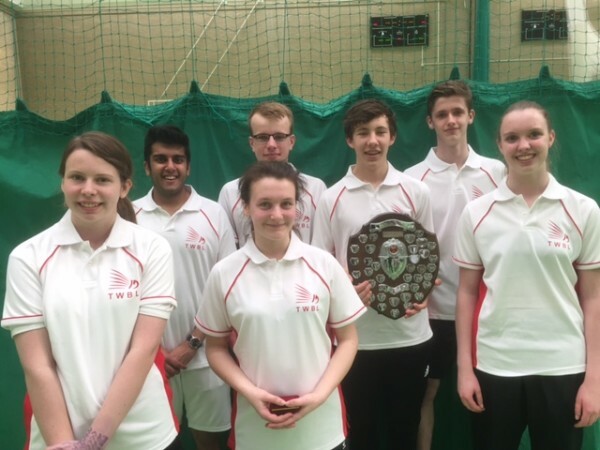 TWBL Juniors win both Kent Inter-Regional trophies.... again! 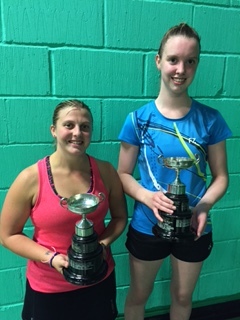 Once again our juniors, ably organised by Alex & Tara Easton, have won the inter-regional trophy in both age groups (all players can be seen below). Other regions represented were Medway (U15 only), Orpington and North Foreland. This is an annual event that has been taking place for many years and we have had our name on it quite a few times in recent seasons. Particularly well done to Hannah and Annabel who were playing in their first competition of this type and also to Rohan Shergilll who although he would have had a lovely time playing in his own age group (U15) had to take one for the team and play up against the U19s. Both Hannah and Annabel won points against the two weaker teams in the U15 group proving they were not out of their depth at all despite only playing the sport for a relatively short time. The closest match for the U15s was against Orpington and the two stand out performances of that match were David playing first singles and Prabhav playing 2nd singles. Both won against older County squad opponents who have beaten them in the past. So it was their points, backed up by a solid boys doubles and Shivani winning her singles (more comfortably!) that gave TWBL a 4-3 win and secured the Trophy. Rory captained the U19s to a comfortable win by strategic use of his girl power (Emily Easton, Emily Tillman and Alisha Gupta) who in combination were stronger than the girls in the opposition teams. So together with his own points they were comfortable victors. 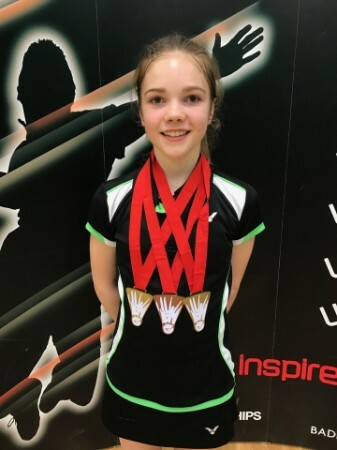 Holly Williams (HBC junior) takes 2 Golds & 1 Bronze in U15 English Nationals! It is perhaps no coincidence that Hildenborough Ladies A have risen to the top of the TWBL Premier division this season with 4 of the team aged U17 and all junior training under the watchful eyes of Jo Muggeridge & Alex Easton. At this year’s Nationals 13 year old Emma Goddard made it through to the quarter finals of the U15 ladies singles whilst Holly Williams stole the show with a stunning display of controlled shot making to take Gold in the U15 Mixed partnering Neil Bhabuta & Gold in the U15 ladies doubles partnering Gauri Shidhaye. Holly fell short in the ladies singles after a 3 set loss to Sofia Nicholson in the semi-final but she was magnificent throughout the whole tournament. In the U17 Nationals, HBC’s Rory Easton had another fine weekend reaching all 3 finals only to be un-done in the boys singles & doubles by arch rival Harry Huang with Harry partnering Ethan Van Leeuwen in the doubles. Rory was not to be un-done though as he and Mixed partner Annie Lado controlled the final of the mixed with a 21-7, 21-12 win over Ethan Van Leeuwen & Abbygael Harris. Both Holly (below) & Rory are on International duty in the coming weeks as Holly heads to Ireland for the Home Nations and Rory is off to Denmark for the 6 Nations. 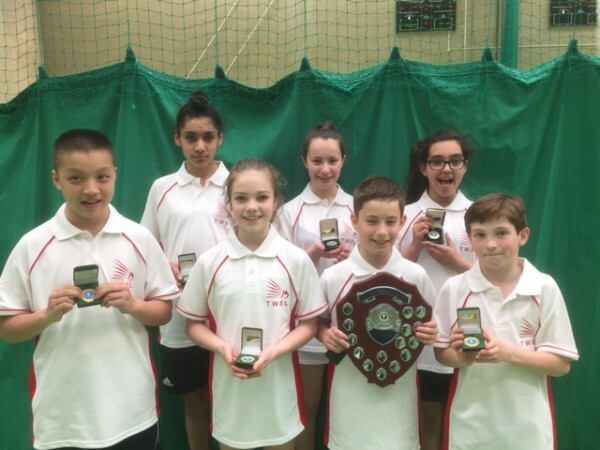 Great success for many junior badminton players from St John's at the Mid Sussex tournament which took place over two recent weekends at the Dolphin Leisure Centre in Haywards Heath. Please see the attached document for a list of their medal winners! 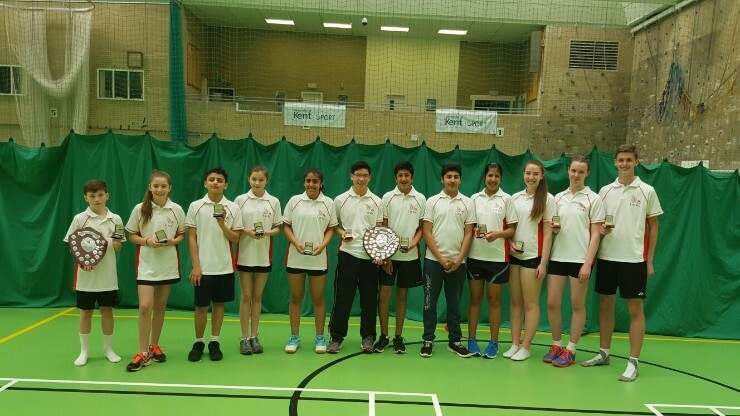 A team of seven Under 15, and seven Under 19 badminton players representing Tunbridge Wells Junior Badminton won the prestigious Kent Inter Regional Badminton Tournament at the Kent University Campus, Canterbury on Sunday 17th April 2016. 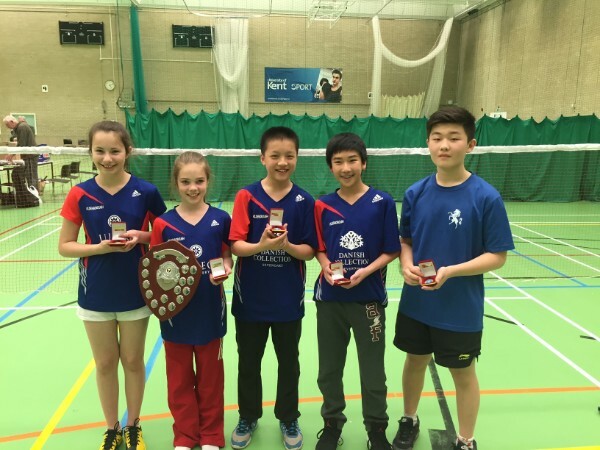 The Kent Inter Regional is an annual junior badminton tournament that places the top juniors from each of five Kent regions against each other. Our teams can be seen below. Ian Kinghorn the Chairman of Tunbridge Wells Junior Badminton thanked Alex Easton of Hildenborough BC for all his assistance in selecting and managing the teams and stated that the wins in both age groups clearly demonstrates that we in the TWBL area have the best juniors in the county and clearly shows that the growing success of junior badminton clubs within the Tunbridge Wells area was paying dividends. February: It is with sadness we report the passing of Jane Turner of Borough Green BC. Jane had played for BGBC since the early 1970's when it was first set up by a group of parents and teachers at Borough Green School, including her dad Len. Whilst at the club she had been their treasurer for some 25 years. The onset of cancer was quite sudden last year and sadly Jane died peacefully at Kippington Nursing Home in Sevenoaks on 25 February. She was 55. Hildenborough, Montreal and Sevenoaks badminton clubs all have part or fully new match venues for the coming season - please see the updated Match Venues document. Also, Paddock Wood BC joins the TWBL for the new 2015-16 season. Several members of Hilden Grange BC are involved in a charity which helps a school out in Kitale, Kenya. Like last year they are organising a quiz and would love to see other badminton players attend for the evening. Please see the attached flyer for all details! The Kent Junior Restricted Tournamament 2015 will be held at Medway Park over the week-end of the 19-20th September. The entry form may be found on the Tournament Info tab to the left. St John's club night changes to a Monday evening and Sevenoaks changes to a Tuesday evening for the 2015-16 season. 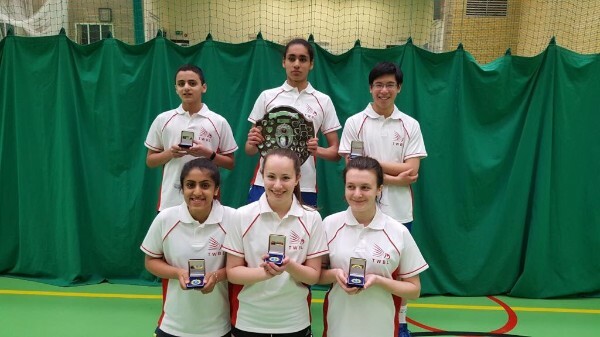 April - A team of six U15 badminton players representing the TWBL won the prestigious Kent Inter Regional Badminton Tournament in Canterbury on Sunday 19th April. Please CLICK HERE for the full report from Ian Kinghorn. 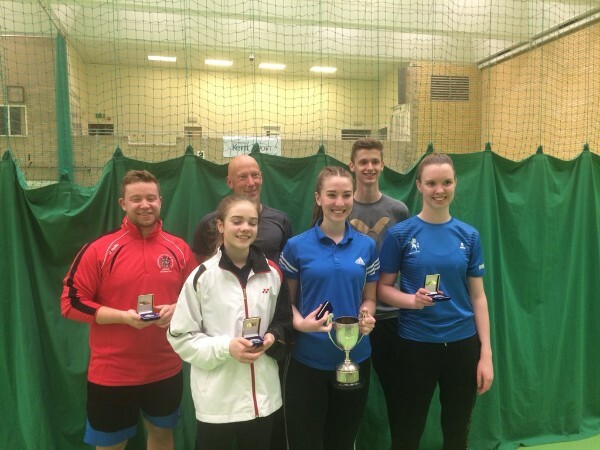 March - Well done to our local juniors who competed in the TWBL Spring Restricted tournaments at the Angel Centre. Several familiar faces from St John's BC won gold or silver medals. The results may be seen on the Tournament Info page. March - It is with sadness that we report the passing of Lucy Mead, former club secretary of Sevenoaks Badminton Club. Lucy had been bravely fighting cancer for several years. She was 46. November - The Nationals are being held at K2 in Crawley, Friday 30 January to Sunday 1 February 2015. Badminton England members get a discount code to use when purchasing tickets. September - Well done to Xander Hurley, competing for Great Britain Deaf in the European Deaf Badminton Championship in Geneva, Switzerland earlier this month. He reached the quarters in the Mens Doubles losing out to the eventual silver medal winners Germany. He also reached the last 16 in the Mixed and the last 32 in the Singles. April - Congrats to TWBL's U15 team who competed in the annual Kent Inter-Regional tournament in Canterbury and for the third year running beat off the competition to win the round robin league. Well done to our team of Alice Xu, Isobel Boshoff, Rebecca Saunders, Luke Bailey, David Zhu, Dominic Mawdsley and Ashwath Hari. 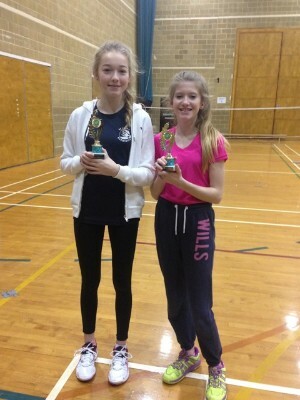 February 2014 - Some of St John's U16 juniors took part in the recent Mid-Sussex tournament in Haywards Heath. Congrats to James Hallet for achieving the Gold medal in both singles and doubles (with Aaron Perry) and to Ciara Barry and Laura Johnson for achieving Silver in the girls doubles. Well done! Thank you to all players who made our senior tournament a success on Sunday 3 November in Tunbridge Wells. Please see the Tournament Info page for the link to all the match details and results and the Scrapbook page for photos of the winners and runners up in each category. September - Congrats to Amanda Wright (Sevenoaks BC) for being picked to play in the Kent Masters' squad for this season. September - HBC's Rory Easton, representing England and partnering William Jones from Surrey, won the inaugral U13 Boys Doubles Adidas Refrath Cup in Bergisch Gladbach, Germany. The TWBL Junior Open 2013 took place in Sevenoaks from 31 July through to 3 August and produced some great matches and moments. Our thanks to Hildenborough BC for administrating this tournament on our behalf, particularly to Alex & Tara Easton. Results on the Tournament Info page. The League AGM took place in June. Thank you to all those clubs who attended. The TWBL committee remains the same as last season, except for Amanda Wright (Sevenoaks) who joins and John Meredith (Hildenborough) who steps down after several years as Treasurer. Ian Kinghorn will take over as Treasurer for 2013-14. Our annual awards dinner and presentation took place in May at the Hadlow Manor Hotel. We hope all those who attended enjoyed themselves. The committee is mindful of a slightly reduced number of people coming along to this event over the last couple of years. If players have ideas as to how the event could be changed or improved for next year, please do get in touch! 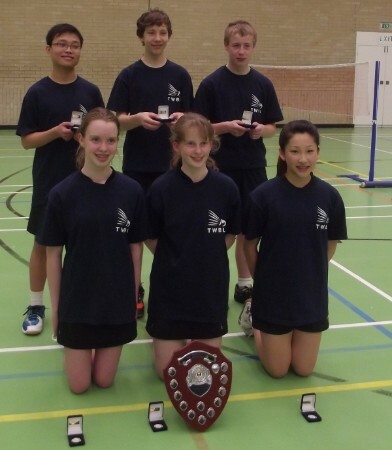 April 2013 - well done to all players representing the TWBL at the Kent Inter-Regional tournament in Canterbury. Our senior team eventually came second, just losing one match to Orpington. But our juniors (u19's and u15's) excelled by again winning both titles. This is now three years running for the u19's and two years running for the u15's. Fab work everyone!